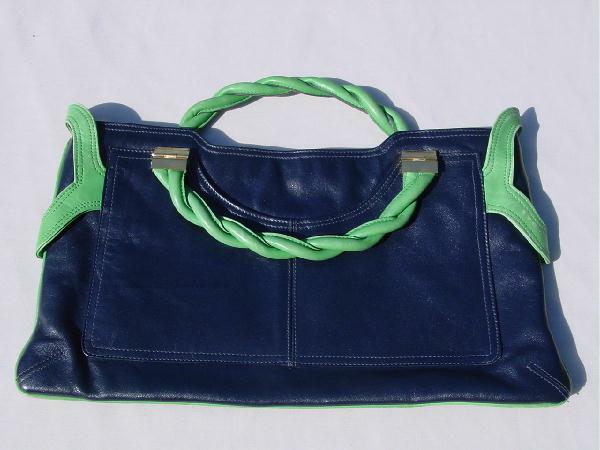 This vintage navy blue leather purse has a trim in lime green leather. It has two 11" handles which have two pieces of intertwined leather in each one, and they are attached to the purse by gold-tone clamps. The front and the back are identical. Each has a scooped open outside pocket. The center section has a side to side zipper opening and a black lining. There is an interior zipper pocket lined in a thick black shiny lining. There is some discoloration (from age) and color fading to the cord edging at the bottom corners and to the side accents. It was used in a photo shoot with a navy blue, white, and lime green scarf tied around the model's head, a white and lime green blouse, navy blue cuffed pants, and a belt with gold-tone accents.